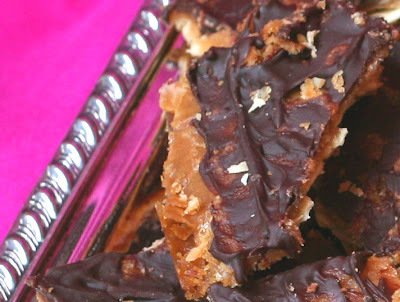 This is an adaptation of a recipe by Marcy Goldman, who is world famous for her delicious Passover confection. It was a huge hit at the seder I went to. I am already dreaming up new variations for next year. My recipe uses the recommended amount of butter and sugar for half as many matzohs. I also use more chocolate, add vanilla to the caramel, and bake at a lower temperature. 1. Preheat oven to 325 F. Line a 10x15 inch cookie sheet with foil. Then line with parchment paper (over the foil). 2. Place two whole matzohs on cookie sheet. Break third matzoh into pieces to cover the parchment paper. 3. In a deep saucepan, melt butter and sugar over medium heat and bring to a boil for 2 minutes. Add vanilla extract and continue cooking for 3 minutes. 4. Pour caramel over matzohs, using a knife to spread it evenly. 5. Bake for 15 minutes. Remove from the oven and immediately sprinkle with chocolate chips. 6. After 5 minutes, spread the melted chocolate in an even layer. Add sliced almonds, if desired. 7. Let cool for 15 minutes and then break into odd shapes using a knife. 8. Place cookie sheet (or transfer pieces to a plate) in fridge or freezer to cool. 9. Can be stored in an airtight container for one week (though it won’t last that long). Hey all you people out there in "Aly Land"..............this is the most outrageous treat on this planet. I am one of the lucky people who have had the pleasure of spending the past 3 seder's (has it really only been 3?) with Aly. His charming personality coupled with his culinary expertise places him at the top of my good cooks list. Can't wait to make this recipe and I don't intend to wait for next Passover.